And today I am happy to show you these coasters, made with the leftover yarn from Willow's blanket. After making two coasters I had just a wee bit of yarn leftover, which of course I will keep because when it comes to yarn you just never know when a tiny scrap may come in handy. Those are really pretty coasters. What is the pattern you used to make them? I love making coasters too. As for the pattern, it is one that I printed from somewhere years ago and I really do not know the source. Sorry. If you would like, I could type it out and send it to you??? Let me know. Coasters are satisfying projects. I Like yours. I agree. 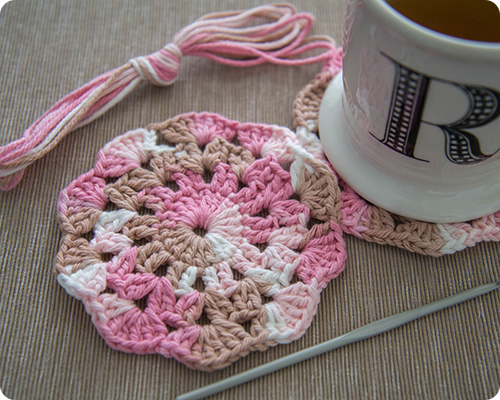 It is quite satisfying to start and finish a project in one sitting, and have something pretty and useful as well.